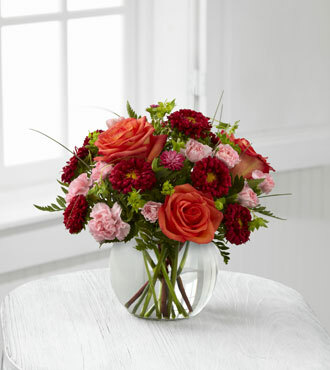 The FTD® Color Rush™ Bouquet by Better Homes and Gardens® sweetens the moment with breathtaking color. Orange roses and light pink mini carnations combine with red matsumoto asters and fresh greenery to make this cheerful arrangement. It comes in a lovely bubble bowl vase, ready for a rush of smiles with every glance. Add an optional box of chocolates for the ultimate surprise! GREAT bouquet includes 8 stems. Approx. 11"H x 12"W.
GREATER bouquet includes 12 stems. Approx. 12"H x 13"W.
GREATEST bouquet includes 16 stems. Approx. 13"H 14"W.